Several months ago I got an email from the Swindells Center in Portland, Oregon asking me if I would consider speaking at one of their educational series events. What was followed was an exciting sense of finding a kindred spirit in this organization. We share a desire to enable the parent(s) to become the leader of their child's team not them into systems that may not work for their child as an individual. Swindells Center was created because of a gift from Bill and Ann Swindells, whose daughter Jean experienced Downs syndrome. They supported the creation of the Center because they didn't wish other parents to experience the difficulty in finding resources that they had experienced. When I heard that I could so identify with that purpose because that's why I wrote Parenting Your Complex Child - not wanting other parents to go through the struggle we have. Swindells' Director, Anne Saraceno, is bubbly and obviously full of energy. During dinner before my presentation last Tuesday, I could hear her total understanding of what parents experience and commitment to supporting a better life for the whole family who experiences special needs. I saw the same commitment and understanding in Mary Halvorson, Education Co-ordinator. Swindells Center is housed in Providence Child Care Center which is a part of Providence Hospital . They also have centers in Medford, Oregon and Hood River, Oregon. To my delight, I learned that they will be opening a new center in Bend, Oregon near me sometime before the end of this year. I will post more details for those in this area as I learn opening date, etc. 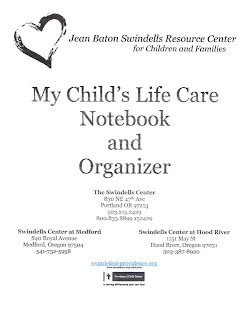 One very helpful thing Swindells offer is a Life Care Notebook and Organizer free to Oregon parents and available to out of state parents for $20. The loose leaf notebook contains a place to list your child's care needs, medical history, etc. It comes with dividers and a place for business cards. It is easy to modify according to what works for your child's information. If your child is older or has more intensive medical history it would be easy to insert a document similar to the Abbreviated Chronological History I do. Mary shared with me that a Mom had been in training and completed the care notebook for her child. On the way home from the training she became very ill and had to be rushed to the hospital. She was able to hand the notebook to her husband, who had to work, so it could be used to care for her child. Without the notebook the child would probably have had to go to a medical foster home during the mother's hospitalization. With her care listed he or she was abled to be cared for at home with much less stress. If you'd like to order this valuable tool you can call Swindells at 503-215-2429 or email Swindells@providence.org . You can also download it by clicking here for free. The advantage of ordering from Swindells rather than downloading is that they will send it in a wonderful binder/organizer and will be able to help you individualize pages to your needs. Additionally, they will register you to receive updated pages when available. I just found your blog and I'm glad I did. My daughter is autistic, high functioning, but she is still very complex. I have a blog devoted to her and autism and it is so nice to see another mother who has done that as well. It is heartening. The blog linked with this blogger name is my personal one, but it has links on the sidebar to 'Chasing The Answer' which is about my daughter. I hope you come by some time. Be well. I;ve never been to this site and I find it a little complicated to get around, however I have been searching for places on the internet where parents with children and young adults with special needs could post questions and get answers about parenting. I am glad to see there is another person from Oregon on the web. With that said, I too had a booklet mailed to me and am happy to start writing all the info that would be useful for others to see what my daughter with Down syndromes life is about and remind me as well. I too have a blog devoted to my daughter with a rare chromosome deletion. I started the blog in hopes of finding more parents and support like this. Thanks for the info.